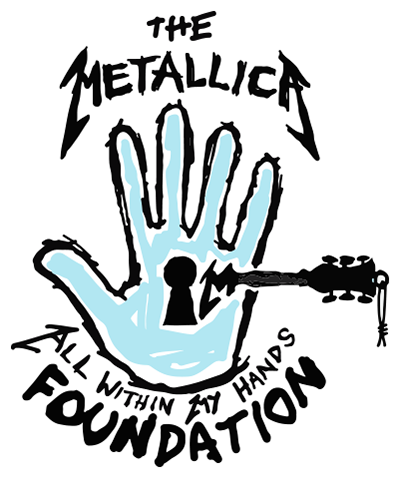 For All Within My Hand’s inaugural campaign, the Foundation teamed up with CrowdRise to conduct a fundraiser that ran throughout the 2017 North American Tour. In addition to physical prizes awarded to some winners, others received Meet & Greet experiences, front-of-stage pit passes, concert tickets, and access to pre-show parties at 22 stops throughout the tour. One lucky Grand Prize Winner traveled along with the band on a private plane to their tour stop in Atlanta! The band contributed two exclusive experiences to the Tony Hawk Foundation’s Boards + Bands Auction, hosting the winners for a behind the scenes visit to Metallica’s Bay Area HQ. The experience included the opportunity to tour the facility, sit in on a recording session, enjoy lunch with the band, and raid the merch room. Metallica has also donated to the NBA’s Golden State Warriors Community Foundation’s Annual Charity Poker Tournament providing VIP experiences including passes to rehearsals, behind the scenes stage tours, tickets to shows, and Meet & Greet passes. In March, Metallica wrapped up the 2018/2019 North American Tour and CrowdRise campaign which awarded prizes in the form of tickets, Meet & Greet passes, and pre-show party passes for every show. Plus lucky winner, Shannon, and her brother, Rob, won a flyaway VIP trip to the final date of the U.S. tour to see the show and meet members of the band, all to support All Within My Hands.